We’re a little past September TV premiere season, but online, the new shows keep coming. Today, Amazon officially launched the first three episodes of Alpha House, its first original comedy series. 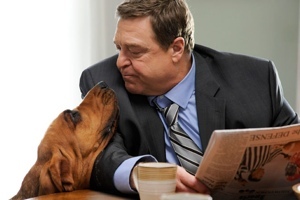 The show, about a group of Republican senators sharing an apartment in Washington D.C., was created by Doonesbury cartoonist Garry Trudeau and stars Roseanne alum John Goodman. The show itself is a modern political tale – the Republicans in the show face Tea Party challengers. Alpha House features marital infidelity, over-the-top political arrogance, closeted gay senators and even a guest star visit by Stephen Colbert. It makes welcome escape for the rare American who isn’t quite getting enough marital infidelity, over-the-top political arrogance and the like from their current real-life senators. Show creator Trudeau is unapologetically left wing, and that fact shows itself from time to time in the series. Still, Alpha House is getting solid reviews. “While not as funny as HBO's 'Veep,' the premise is solid (house-sharing is common) and brings a sense of freshness to the scripted world,” says Tim Goodman of Hollywood Reporter. If you’d like to make up your own mind about Alpha House, Amazon is making the first three episodes available for free to all comers. New episodes will continue to be released every week for Amazon Prime members. You can watch Amazon's Alpha House here.